Under Texas law, within 30 days after the executor or administrator is qualified by the probate court, she must publish a notice to creditors in a county newspaper advising any of the decedent’s creditors of her appointment. Within 60 days of qualification, she must mail a certified or registered letter with return receipt requested to all secured estate creditors. Such creditors include those whose claims are secured by a mortgage, deed, or a property lien. The executor or administrator files proof of both types of notice with the clerk of the court. 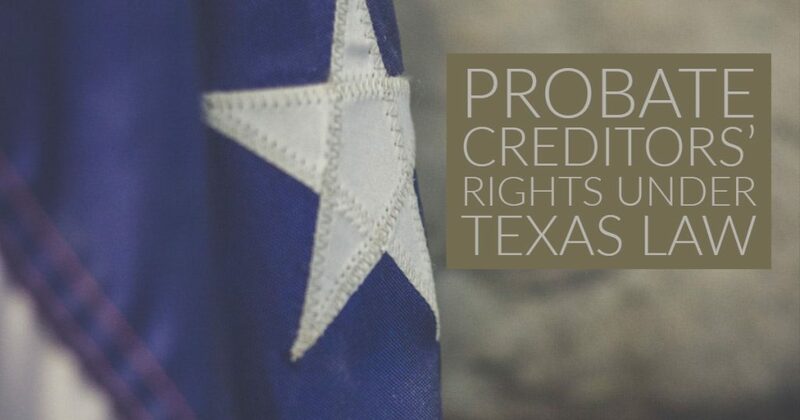 While Texas probate law does not state that other types of creditors must receive notice, it may be advisable to do so. While unsecured creditors include credit card companies which will send statements to the decedent’s physical or e-mail address, this might also include unsecured personal loans made to the decedent. In the latter case, the executor or administrator should provide notice via registered or certified mail to any unsecured creditors before the estate administration closes. The notice must state that the creditor has four months for bringing forth any claims against the estate. If the unsecured creditor does not act within that time period, debt collection may be barred. Once the creditor establishes a claim as an estate debt, payment is subject to a classification priority if the estate’s assets cannot pay all claims. The first class is for the decedent’s funeral expenses and any expenses incurred during his final illness. As of the time of publication, these expenses cannot exceed $15,000. Claims above that amount are considered unsecured debt. The second class concerns estate administration and expenses incurred in estate management. The third class deals with secured claims. The fourth class includes claims for child support arrearages, while the fifth class deals with any taxes or penalties due to the state. If the decedent was ever confined in the Texas criminal justice system, the sixth class concerns claims for these costs, while the seventh class seeks reimbursement for Medicaid payments made on the decedent’s behalf by the state. All other claims fall into the eighth class for unpaid taxes, and these must be paid prior to other claims against the estate. If a claim is presented to the executor and administrator and that individual rejects the claims, the creditor has the right to sue the estate for payment. Accounts titled as payable on death or transferable on death to a beneficiary do not pass through probate. Under Texas law, such a beneficiary receiving payment shall be liable to the executor or administrator for amounts owed by the decedent to creditors to the extent needed to discharge unpaid claims after probate assets are exhausted. However, the beneficiary is not liable to pay more then he received from the account. If you’re a creditor of a deceased Texas resident, act quickly to submit claims to the estate. Wait too long and you’re out of luck. Whether or not you receive payment depends on your creditor class and whether the estate contains sufficient assets to pay off all creditors. Next PostNext What is a Quit Claim Deed?